Every year or so, a new lost shipwreck is discovered somewhere in the Great Lakes. Many are remarkably well preserved because of the cold, freshwater in the Great Lakes. With literally thousands of ships lost (some estimate as many as 8,000) in the inland seas, it's likely this trend of discovery will continue. Perhaps the most coveted and yet to be discovered lost shipwreck in the Great Lakes is that of Le Griffon. Le Griffon was a French barque ( or "bark", referring to the rig which consists of multiple masts, fore-and-aft sails on the aftermost mast and square sails on all other masts) commanded by famed French explorer Robert de LaSalle. She displaced around 40 tons and was likely only 30 to 40 feet long. LaSalle was seeking a Northwest Passage to China for France. Le Griffon was launched in 1679 by LaSalle as a way to control the fur trade with Native Americans in the Great Lakes region. 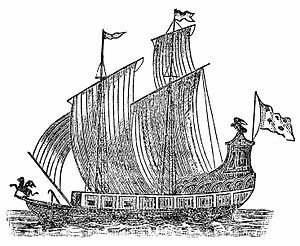 Le Griffon may very well be the first “ship” to have sailed on the Great Lakes by some criteria (decking, permanent masts, bearing a name). Surprisingly, Le Griffon disappeared on the return trip from her maiden voyage. The ship left her birth place on the Niagara River in July of 1679. She made her way into Lake Erie and on through the St. Clair River into lower Lake Huron. After weathering an August gale on Lake Huron, Le Griffon and crew made port at Mackinac Island. They pushed on, likely to Washington Island at the mouth of Green Bay, where they met up with Pottawatomies and fur traders that La Salle had sent ahead to begin trading. La Salle stayed behind as he ordered the crew to take the newly acquired furs back to Mackinac Island aboard Le Griffon. After holding up near Washington Island in Lake Michigan while waiting out another big storm, Le Griffon departed on September 18, 1679 to drop furs at Mackinac and make her way back to the Niagara River. The ill-fated ship and crew were never heard from again. While some theories suggest foul play amongst the Pottawatomies may have led to her disappearance, a more likely scenario is that Le Griffon was lost in the stormy waters of the Straits of Mackinac. Historical records indicate a storm did occur shortly after Le Griffon set sail from Washington Island. A third scenario that La Salle himself considered after hearing rumors amongst the Native Americans was that the crew of Le Giffon scuttled her and ran off with the furs. No matter the true story, many shipwreck hunters have searched for the missing ship ever since. It’s not uncommon for Great Lakes shipwrecks to go un-identified after they’ve been found and there are at least a few that may indeed be Le Griffon. There are unidentified wrecks off the western end of Manitoulin Island in Lake Huron and another off of Escanaba in Lake Michigan that have archeologists, shipwreck hunters and historians digging for more clues. The most promising find is a wreck discovered in 2001 at an undisclosed location by the Great Lakes Exploration Group. In late 2010, GLEG released a press statement announcing an ongoing assessment of the site and a cooperative agreement between GLEG, the State of Michigan and France that describes the process for documenting and identifying the suspected shipwreck. The agreement stipulates that the investigation must be completed by January of 2012, so we soon may finally have a conclusion to the final chapter of Le Griffon’s story.